Peyton Manning is as close as it gets to a sure thing in fantasy football. Peyton Manning might not be the best overall quarterback any given year, but he’s bound to be a Top 5 quarterback — and usually a Top 2 selection. Besides steady production, Peyton Manning is certain to be on the field every game. In ten pro seasons, Peyton Manning has never missed a start. That would be 160 straight games played. Manning has a quick release of the ball, meaning he doesn’t get hit as often as many NFL quarterbacks. Of all QBs in the NFL at present, Peyton Manning is the only one with a chance to break Brett Favre’s consecutive starts record. The problem with Peyton Manning as a fantasy football player is, everybody knows how productive and durable Peyton is. So he’s drafted high every year — usually as a 1st rounder. That means you’re passing over talented running backs and superior wide receivers in order to draft a quarterback, when there will be a certain number of passers who are almost as good as Peyton Manning. There’s a reason why teams that draft Peyton Manning usually end up missing the fantasy playoffs. So let’s focus on the dilemma of drafting Peyton Manning or not. When is virtually assurance at the quarterback position worth a high round draft pick? Everyone knows that Peyton Manning is the son of former NFL quarterback Archie Manning. Peyton lived most of his youth in New Orleans, where Archie was one of the radio voices for New Orleans Saints ballgames. Peyton Manning attended the University of Tennessee, where he was a standout passer all four seasons for the Vols. Despite this, many thought Peyton Manning couldn’t win the big game, mainly because Tennessee could never beat their SEC rival, the Florida Gators, during the best years of the Steve Spurrier era. Peyton Manning was considered the lock for the 1st overall pick in the NFL Draft in 2008, though some wondered if Ryan Leaf (with a supposedly bigger arm) shouldn’t be taken ahead of Peyton. The Colts drafted Manning as their guy, and he started every game his rookie season. 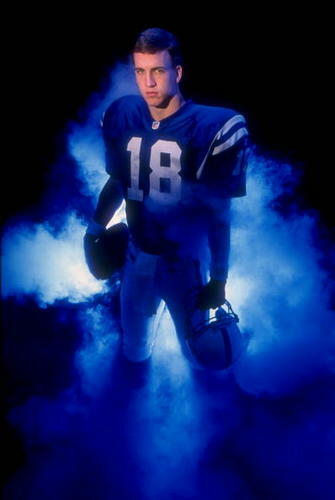 Peyton Manning threw 29 interceptions that season, playing for an awful Colts team which was devoid of high end talent. Still, Peyton Manning showed he had the skills to be a star in the National Football League. Peyton Manning led the Indianapolis Colts to the playoffs in his 2nd season, and incidentally became a fantasy football stalwart. Peyton’s been going to Pro Bowls ever since — and been drafted in the 2nd round or higher of fantasy drafts. Meanwhile, the myth continued that Peyton Manning couldn’t win the big game. There was even the talk he was a choker. People said that Manning put up the bigger numbers, but Tom Brady won Super Bowls. To give on final poke, Patriots fans noted that Tom Brady did this with lesser receivers. Of course, this overlooked the fact that Tom Brady and the New England Patriots had a much better defense all those years. Had Peyton Manning played on the same team with a great Bill Belichick defense, there’s no telling how many Super Bowl games he might have won. 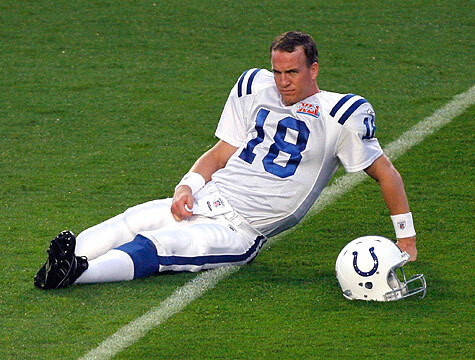 After a particularly painful flameout in 2005, when Peyton Manning set an NFL single-season record (and rocked the fantasy football world) with 49 touchdowns, the Colts lost in their first playoff game, despite starting the season at 13-0. Only a Superbowl victory the following season ended all the talk of Peyton and the Colts choking. Peyton Manning enters the 2009 as the most forgotten quarterback in the Top 5 QBs. Manning has been in the Top 5 forever, and he’s been as consistent as anyone could hope. But Peyton Manning has lost some of his longtime weapons recently, while newer and younger quarterbacks have come on the scene. Marvin Harrison and Edgerrin James are gone (long gone in the case of Edge), while Joseph Addai looks on the verge of being replaced by Donald Brown (eventually). That leaves Reggie Wayne and Dallas Clark as Manning’s only favorite targets remaining on the team. Reggie Wayne had a little trouble holding up to the role as the unchallenged #1 last year. Reggie Wayne started out the first six weeks looking like a world-beater, but the second half of the NFL season was a complete disappointment. 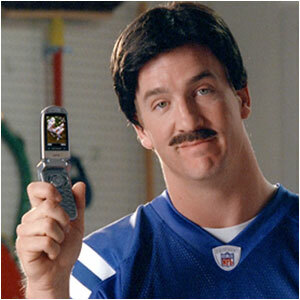 Dallas Clark, on the other hand, became Peyton’s favorite target. Look for Dallas Clark to challenge as the #1 tight end this year, if healthy. Peyton Manning will have to rely on him more than ever. That’s because Peyton’s receiving corps is more of an unknown factor than in the last ten years. Anthony Gonzales moves into the #2 spot to replace Marvin Harrison, and Gonzales has shown promise in spot duty and as the 3rd receiver. Whether he can step up to be the 2nd receiver is still a question, though. Pierre Garcon and Austin Collie (R) are fighting it out for the 3rd wide receiver spot – which it looks like Collie will win. If Reggie Wayne can’t live up to #1 WR status and Anthony Gonzales live up to #2 status, Peyton Manning might finally see some fall-off in the production category. That’s why I have Peyton Manning as the 5th overall quarterback in fantasy football 2009, behind Drew Brees, Tom Brady, Aaron Rodgers and Philip Rivers. Last year, Peyton Manning put up another fine season, despite the loss of Marvin Harrison to injury. Manning made up the difference by helping Reggie Wayne to his best season as a pro, while also dumping off underneath to Joseph Addai. Once again, though, Peyton Manning’s year was overshadowed by the New England Patriots, who went 18-0 before a Superbowl loss. Tom Brady broke Peyton Manning’s touchdown record. Expect to see Peyton Manning post another huge year in 2008. Marvin Harrison is returning from injury, while Anthony Gonzales should be more comfortable in his second year with the Colts. Tony Ugoh should also be a better player in his second season as Manning’s left tackle. Meanwhile, Reggie Wayne and Joseph Addai should be in the prime of their careers. Keep an eye on Peyton Manning’s post-surgery recovery. He just went under the knife to have a bursa sac removed. This should keep him out for 4 to 6 weeks, which should wipe out most of Indianapolis Colts training camp. That’s no big concern for an 11-year veteran who is familiar with all his major receivers. In fact, the recovery program should save Peyton Manning the rigors of a training camp. 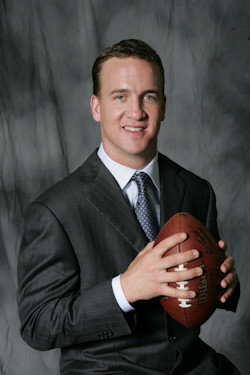 If he can get in a little work late in the preseason, Peyton Manning should be ready to hit the ground running in 2008. Until Peyton Manning misses a regular season game, I wouldn’t worry too much about his injury. On the other hand, I would really talk it up around the guys in my local fantasy football league. With Tom Brady likely to be everyone’s #1 quarterback in fantasy football drafts this year, he’s certain to fall a little later than usual. The 3rd overall quarterback in a fantasy football draft is likely to be late 2nd round or early 3rd round, in the right leagues. At that point, you’ve already added a stud running back (likely) and might have added a second solid runner or a stud receiver. Once you have a core to build around, Peyton Manning becomes a luxury you can afford. Grab him and expect the same premium numbers as always. More likely, he will slide from late 1st to middle 2nd. At that point, I would still prefer to take my chances on a quarterback 4 to 5 rounds later. You could be passing up on a solid 2nd round runner or one of the stud young wide receivers in that spot. So spot your picks with Peyton Manning and try to steal him, but don’t get too cute if the draft doesn’t fall that way. Let the game come to you.